Oh, my, but this was fun to watch! These lines of yellow undulated and moved and really responded to the breezes. I spent some time examining how they were hung in sections, even between branches of the tree. Then the individual yellow pieces are rather cunningly attached in mini-hierarchies that give them flexibility, yet unite them into a whole. The bright yellow contributes to the whimsy of this piece. 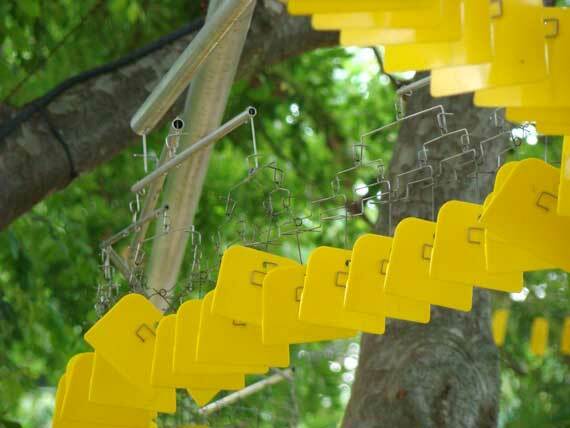 I found other installations that Prentice has also called Yellow Zingers pictured on the web that had more lines or arcs of yellow, which would have been quite the eye-candy. I suspect the two lines were the best match visually for these less-than massive trees. Nevertheless, they seemed just a tad crowded into this spot. This sculpture is not where it’s shown on the program. In that spot there’s an empty, lonely bench. 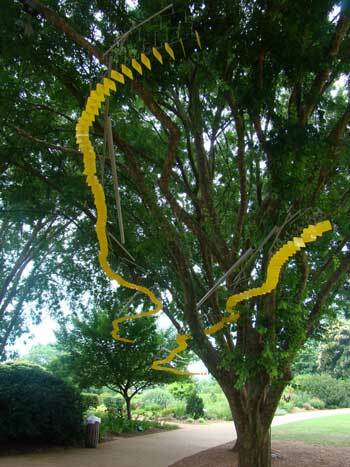 Perhaps the original idea had been to thread the yellow zingers through the crape myrtles in that section of the garden. I suspect those plants, now laden with blooms, were too dense and fine-grained to be a good match for zingerdom.